THREE WORDS: BANDWIDTH ON DEMAND! Recent years have seen a tremendous and accelerating increase in demand for data networking capacity from carriers and enterprises. The multiplication of mobile and connected devices, the proliferation of streaming video-based applications, and cloud-based services will only augment the challenge of delivering capacity and ensuring quality as data moves from web to mobile to machines. In an on-demand world, how can carriers and ISPs offer their customers bandwidth (and other network services) that can scale orders of magnitude on-demand, without having to massively overprovision their networks and drive up costs? 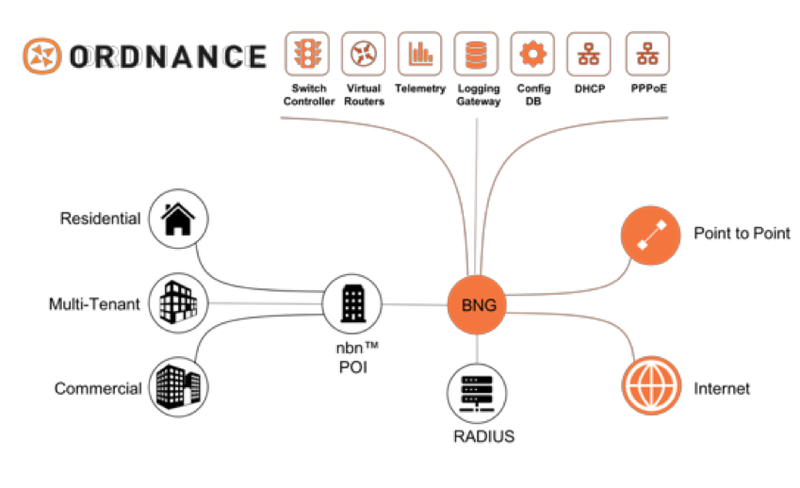 With the advent of the Australian National Brodband Network, NoviFlow and Ordnance teamed up to build an SDN-based centrally-controlled distributed data plane delivering an unprecedentedly flexible BNG services platform specifically designed for the Australian nbn™ Network. The service provides bandwidth on demand portal for customers, along with automated provisioning via APIs, protocols, ssh or manually through web portal interface. The solution is also available as a hosted service in major markets or on-premise for large-scale networks. The One Minute Network: Provision a 10Gbps virtual router in any Ordnance POP in under a minute. No resellers, no vendors!